Having seen many gardens over the years, I’ve been on a mission to inspire people to think more towards eco-friendly gardening. My experiences led me to write a book, The Green Gardener’s Guide: Simple, Significant Actions to Protect & Preserve Our Planet focusing on creating an eco-friendly garden and landscape. Even if you implement just one of these 7 tenets, you will be lightening your environmental footprint and creating a more eco-friendly landscape. In the book, I focus on seven key tenets critical to being better environmental stewards. Now, I don’t propose that it’s necessary for you to adopt all seven. if you do, that’s great! Yet, you will be making a difference if you begin to implement any one of these principles in your landscape. Even the little things really do add up. From a “big picture” perspective, creating an eco-friendly garden and landscape is fundamentally about being mindful in your garden activities – doing your homework and thinking through longer-term effects. As you garden mindfully, your landscape and the world at large will benefit – and odds are good that you will probably save a little time and money too. That said, let’s dive into some details. If you are familiar with many of my earlier podcasts, you probably know by now that I am a big proponent of the efficient use of water. Why? After all, the Earth is often called the Water Planet, right? You may be surprised by how much (actually, how little) of our planet’s water is available for drinking, bathing, and watering. Check out some water facts I shared in a recent waterwise series blog post. Energy use is another aspect few of us think about when it comes to water, but the statistics are striking. I discussed how water consumption also drains energy resources in a podcast with Nan Sterman, so I encourage you to check that out too. While I was researching for my book, I read Charles Fishman’s book The Big Thirst: The Secret Life and Turbulent Future of Water. In it, the author makes a great point: All the water we have now was available 4.4 billion years ago. None of that original water supply has been destroyed, but no additional water is being created either. So, the issue really isn’t diminished supply, it all boils down to where that water is available. Water moves around the planet primarily through evaporation. For instance, water which became airborne in the South China sea might fall as rain in Seattle. Where and how quickly water reappears for use is very unpredictable, as it is intensely climate-dependent. Water conservation is primarily about protecting your local water resource so that it continues to be available locally. This emitter tubing has small water emitter holes at measured intervals, so I can deliver water right where I want it in my raised beds at the GardenFarm. Back in the 1990s, my hometown of Atlanta was experiencing a severe dry spell. Officials predicted and announced that, if our area didn’t receive rain within a certain period, the water supply to the greater Atlanta area would be dried up. Completely. Realizing there may not be any water available – to millions of people – was a real wake-up call. Fortunately, we did receive rain before our water infrastructure reached that critical level, but there are areas all over the world which aren’t so fortunate. During the past century, Earth’s population has quadrupled in size. That’s a lot to be sure, but when you consider that water usage during the same period has increased sevenfold, it’s easy to see why it’s important for all of us to be more mindful of our water use. All of this to stress the critical need to water more efficiently in our landscapes, because it’s such an easy change to make. Overhead watering is the most wasteful method for watering – hands down. Sometimes it is necessary, but if you water with a sprinkler, just be mindful. As often as possible, avoid watering during the heat of the day. On average, half of the water released from a sprinkler during the hottest part of the day is lost to evaporation. If it’s windy, those tiny droplets drift in the breeze – meaning you need to water longer to provide the right amount to your lawn or plants. The best time to water is early in the morning, during the dew period. In those early hours, the cool air creates less evaporation, and there is usually little or no wind. The other benefit is to your plants themselves. Early watering minimizes the length of time plant tissue remains moist, so foliage will be less susceptible to airborne diseases. It’s a win/win. You’ve probably heard it from me before, but I’ll say it again. 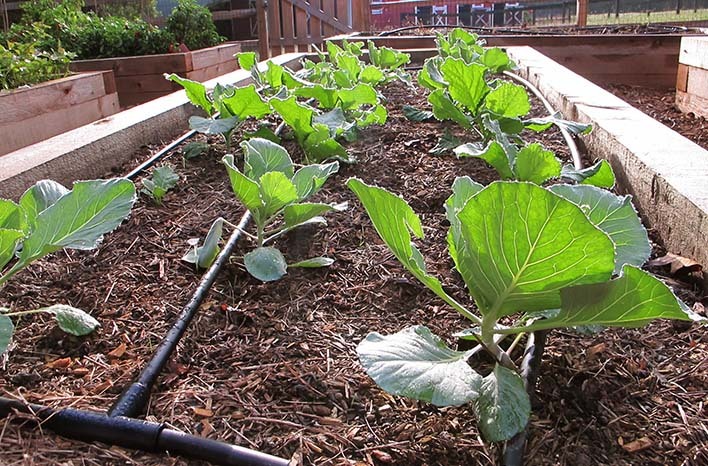 Drip irrigation is the most efficient – and therefore – my favorite way to water my garden beds. Emitter and drip irrigation tubing keep water near to the base of your plants (where they need that water most), it keeps the water targeted (so you aren’t inadvertently watering the weeds too), and the larger droplets delivered low to the ground means less evaporation. 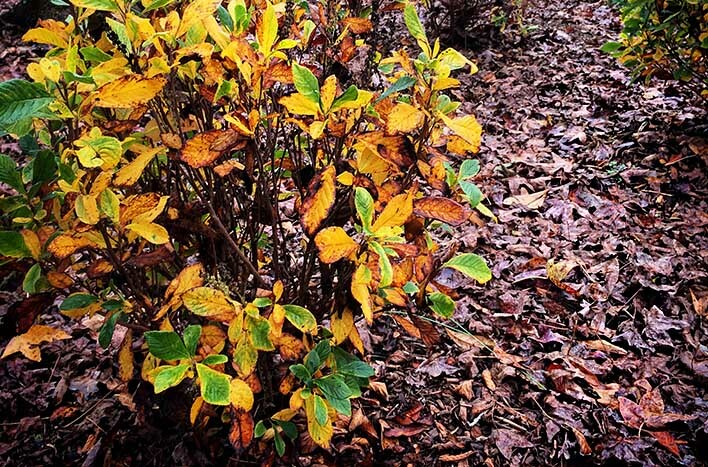 Mulching any exposed soil in your garden and landscape beds will provide many benefits – moisture retention, reduced erosion, weed control, and so much more. Here’s one of the best parts: For just a few dollars, you can buy an inexpensive, battery operated timer to install on your hose or spigot. The timer allows you to control when the water turns on and how long it runs before shutting off. It will keep your plants watered even during those times you aren’t around to do it yourself. I use emitter tubing controlled by timers at the GardenFarm™, and they save me water and time every day. But let’s not forget about the water you use indoors. A great way to use water more efficiently is to store “warm-up water.” Warm-up water is what I like to call the water that pours down the drain any time we run the kitchen or bathroom faucet until the water gets hot. Slide a bucket under the faucet to capture that water and save it for use in your garden. I store several buckets around the GardenFarm, and they are an especially great resource during those times of watering restrictions. 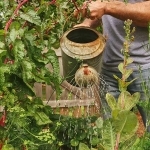 Warm-up water can save your prized or particularly thirsty plants during long, hot dry spells. When the rain does fall, be sure you have a rain barrel or two in place to capture and store that clean and precious resource for use in the garden. A rain barrel typically holds 50 gallons; and when you consider that 600 gallons of water falls on an average-sized, 1,000 square foot roof during an inch of rain, it’s pretty clear how quickly you could collect a hearty supply of rainwater. Speaking of rain, let’s talk about runoff. As water moves across your lawn or garden beds, it’s carrying with it residue and particles of whatever is there. If you’ve ever had a lawn care professional treat your lawn with fertilizer (while wearing what amounts to a Hazmat suit, by the way) and have been left with those little signs warning you to keep kids and pets off the grass for 24 hours – remember that those chemicals move across your lawn with water from rain or over sprinkling, and they move on in to the nearest watershed. Maybe you don’t treat your lawn? Odds are pretty good that one of your neighbors does, and since water seeks the lowest level, water from their property may still be trickling its way onto yours. I used to own a home with a small creek that cut through the backyard. Whenever the rains fell, water from neighboring subdivisions would run from streets, driveways, and sidewalks into the storm drain. The storm drain emptied the water into a culvert, which emptied the water into the creek on my property. The creek then emptied into a nearby lake. The water running in my creek on those rainy days was a putrid neon green from all the chemicals it brought along for the ride. By the time it reached the lake and moved on into other watersheds, it was quite a chemical cocktail. Shredded leaves are my favorite mulch material. They are free, plentiful and break down over time to improve the health of the underlying soil. Obviously, we can’t control what happens “upstream” from our properties. However, we can minimize runoff of our own. 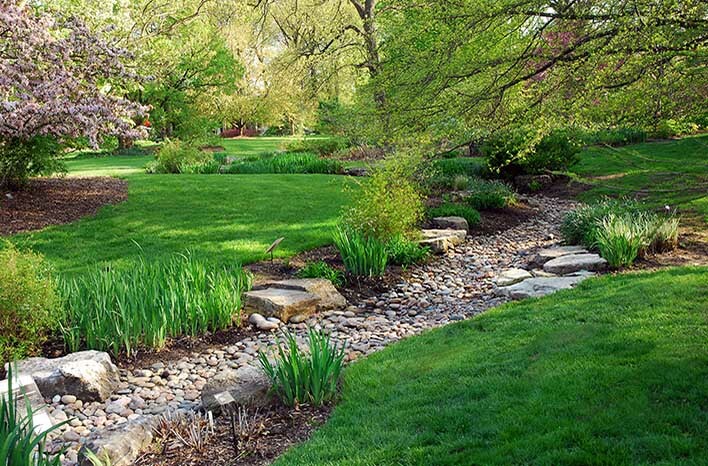 Installing a dry creek bed on your property can add visual interest, but its real value is in slowing down moving water. The bed doesn’t need to be large or elaborate either. 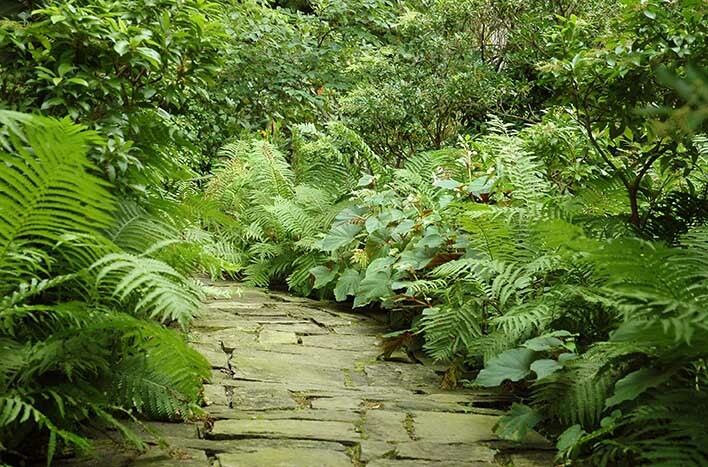 Line it with stones – add some plants to the border, if you like. The intent is that the water will flow into the creekbed (since it will be at a slightly lower level), and the stones will slow the water, allowing more of it to percolate into the bed surface and remain on your property. A quick and easy way to reduce water runoff is to add mulch to any exposed soil. I can’t stress enough how important a role mulch can play in your landscape. The best part of your soil is right at the surface, and mulch will protect that great soil from eroding away with water or in the wind. Mulch protects the soil surface to keep it from crusting over and becoming a hard, impermeable surface. I strongly recommend using an organic material – like shredded leaves or wood chips – for mulch. 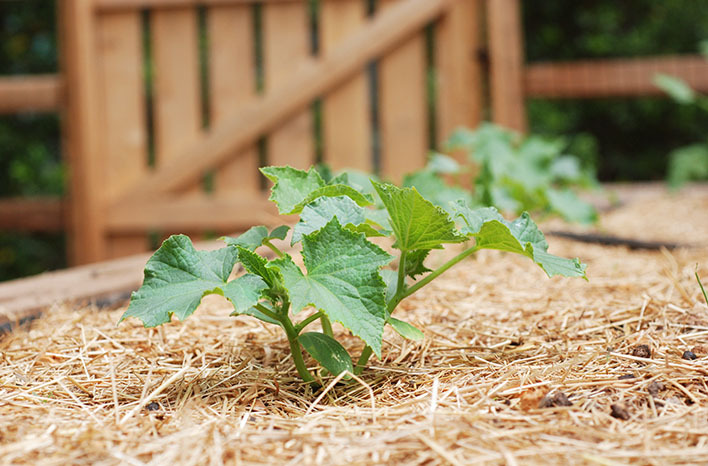 Over time, the mulch will break down and add nutrients to your soil – another big win/win. This dry creek bed feature at the Missouri Botanical Garden is the finest example I’ve seen of this type of feature. The same principles could be used on a smaller scale on any urban property. During my garden show host travels, I have made it a habit to ask my featured guests how they keep their public gardens so beautiful – all year long. These horticulturalists and industry experts have the same answer nearly 100% of the time: Put the right plant in the right place. This single step makes all the difference. In order to thrive, plants just need healthy soil and the right location. When they have those things, they don’t require much help from us in the form of pesticides, herbicides or fertilizer. As an example, a former neighbor of mine took pride in landscaping the area around his mailbox. The spot was hot, sunny and unfavorable for most plants. Initially, the plantings there consisted of various sedums, and they thrived. Hot, sunny and dry is what sedums prefer. One day, my neighbor added hostas to the spot. 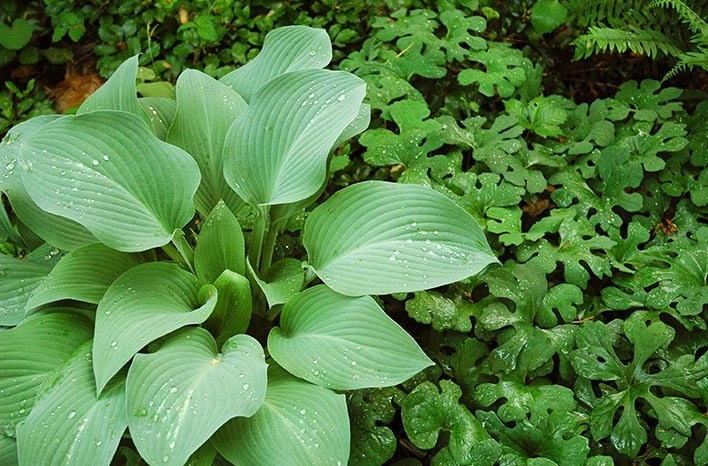 If you know anything about hostas, you know they love the shade and moist soil. It only took a few days for those hostas to look as if they were suffering from disease or malnutrition, but they were simply suffering from being placed in the wrong conditions. So when you purchase plants to add to your landscape, do a little homework. Learn whether they prefer shade or sun or a mix of both. Make note of their preference for moist vs. dry soil. Taking time to pay attention will prevent you from putting a plant in the wrong spot and battling for its survival afterward. If one of your plants does seem to struggle, think the situation through before assuming it requires fertilizer or chemical treatment. Have lighting conditions changed? Is it receiving enough or too much water? Provide the right conditions and feed the soil so your soil can feed your plants. 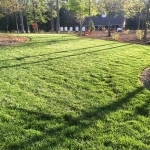 This will reduce your need for fertilizer and eliminate most plant problems. If your hostas don’t look this healthy, it’s more likely because they are growing in the wrong conditions – and NOT because they need fertilizer or some other chemical treatment. Before you pull out a chemical treatment, be sure you understand how to use it appropriately and what the impact of application will be. Pesticides, for example, are often overused and misused. After all, only 1-3% of all insects are considered pests. The remaining 97% are either beneficial or considered benign. When you spray indiscriminately with a broad-spectrum, non-selective pesticide; you are inadvertently killing more good bugs than bad bugs. Always identify the bug you are dealing with. Make sure it’s a pest, and make sure you know which pest it is. That way if you use a treatment, you can use the most benign method possible to treat just that particular insect species. Understand how a treatment works, so you can apply it properly. For example, insecticidal soap is effective at drying up soft-bodied insects, but it won’t do a thing for a bug with a hard shell, like an adult bean beetle. Bt (Bacillus thuringiensis), also known as Dipel, is my favorite organic treatment for insects such as caterpillars, however it will kill butterfly caterpillars just as quickly as pest caterpillars. So as is always the case, a targeted application is the safest application. Manual controls are as benign as it gets. I always prefer to pick the pests off and squish them, drown them in a cup of soapy water, or feed them to the chickens. Better still, you can keep pests from ever reaching your plants by using a barrier like a floating row cover. 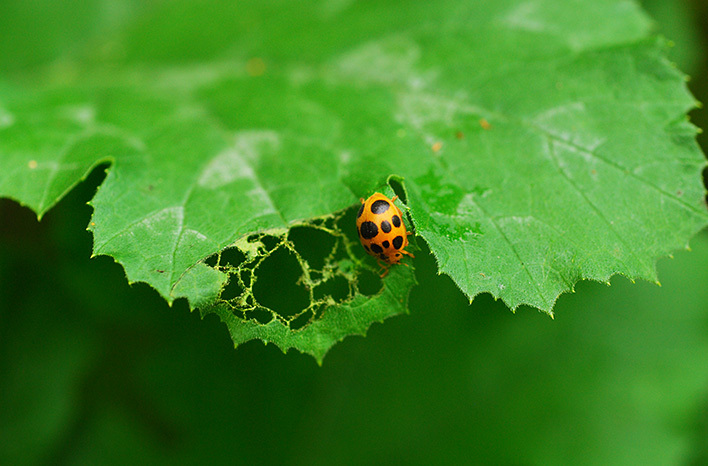 The fabric prevents the adult insect – like a moth – from laying its pest eggs on your plants. Unfortunately, when you take a “scorched earth” approach to insects in your garden, it’s the pest population which recovers more quickly. Since the good bugs are slow to recover, there are fewer of them to help control the resurgence of the bad bugs. This is why Suzanne Wainright-Evans often says that if you have a pest problem and you want to make it worse, use pesticides. Birds can also fall victim to pesticide use. Steven Kress of the National Audubon Society estimates that at least 7 million songbirds die each year from eating insects which have been treated with a pesticide. Other estimates indicate that those songbird deaths may reach as high as 70 million. For all of these reasons, we are better off taking pause before taking action. Good pest management might just mean getting out of the way of the beneficial insects nature has available to provide balance. With a little more patience, we will soon see biodiversity go to work – and beneficial insects coming in to do the pest management for us. This is not a ladybug. This is a squash beetle. It’s important to identify the bug you are dealing with and learn the facts on any treatment you might use. Insecticidal soap would have killed this pest while it was a soft-bodied juvenile but won’t have any impact now that the beetle is a hard-shelled adult. 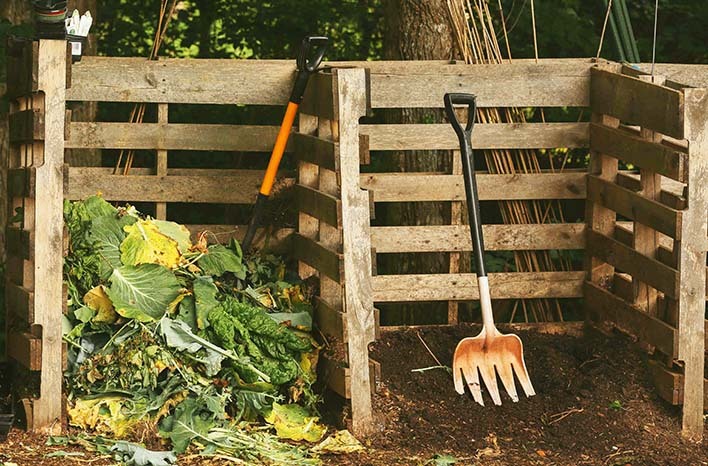 You may have heard me talk a little about compost? Okay, I talk a lot about compost. That’s because compost is the single best soil amendment we can add to our gardens and landscapes. It’s also because it drastically reduces the waste we throw into our landfills. We all know landfills aren’t pretty, but more importantly, they are the single largest manmade source of methane gas, which is 20% more toxic to our atmosphere than carbon dioxide. 65% of what is added to landfills could be composted or recycled, and 40% of that is typically paper, which is a terrific source of carbon in the compost pile. I shred all my paper – printouts, junk mail, etc. – into strips using an inexpensive shredder. These days, inks are vegetable-based, so I never worry about adding these materials to my compost bins. Don’t forget those grass clippings. If you don’t use a mulching lawn mower to mulch clippings back into your lawn, bag the clippings and add them as an ideal nitrogen source to your compost. It is such a wasted resource when we add any of these materials to our landfills. So much of what we add to our landfills should, instead, be added to our compost pile. This “garbage” will break down and become the best amendment I can add to my soil. It can be so tempting to plant only what we think is prettiest in the landscape, and in this respect, native plants have gotten a bad reputation. Many gardeners think of them as messy or just less attractive, but native plants are needed in our urban landscapes now more than ever. All wildlife and beneficial creatures have co-evolved with native plants. They require these plants for shelter and food sources. There are many beautiful native species, and they all have ecological value. Since they have evolved in your area, they will also perform well for you and require less coddling. A word of caution: Just because a plant performs well in your area doesn’t mean it’s native. Many invasive species can gain a foothold, thrive and out-compete anything native to the area. Kudzu is a prime example. It was brought in to the eastern U.S. in the 1800’s and has been a destructive force in our landscapes ever since. It will overtake anything in its path – including structures. So, do a little research online, contact your local county extension office or check out the Xerces Society or Mt. Cuba Center websites to learn which plants are truly native to your region. I’m not advocating that you should be a native plant purist – I’m not. However, I hope – like me – you will make an effort to add more native plants to your garden beds. 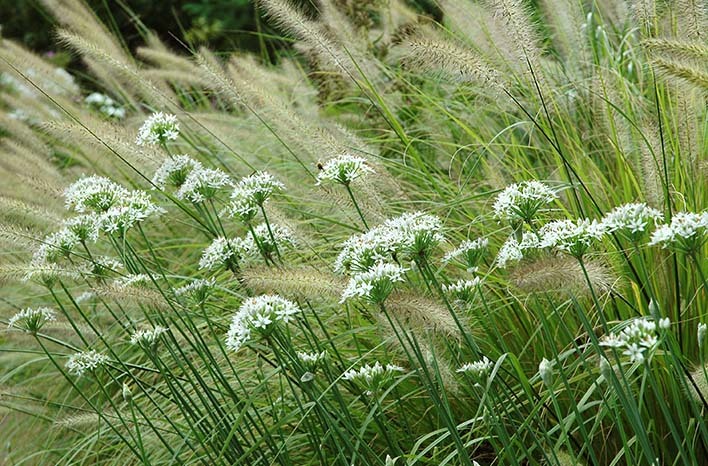 Strive for a healthy balance of native and non-native plantings. A diverse array of plant species in your garden will draw in a wider range of beneficial insects too. There are so many beautiful native plants, and they are needed in our urban landscapes now more than ever. I hope you’ll add a few to your garden beds. So many of the tools we use in our garden emit pollution into our air. Did you know that older model gas lawn mowers put out more pollution in one hour than 40 late model cars? Yikes! 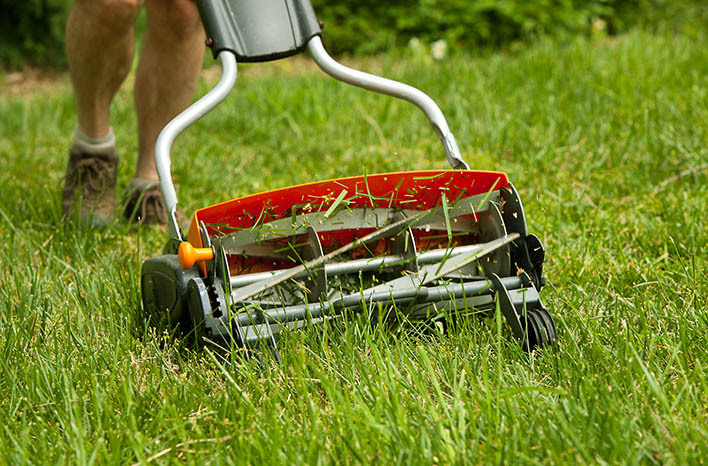 If you have a smaller yard, I encourage you to consider an electric mower or go “old school” with a push mower. I loved my push mower back when I had a quarter-acre property to maintain. Newer push mowers are easy to use, they do a great job, and they can make mowing fun. Rather than pulling out the leaf blower, pull out the rake and get a little exercise in the bargain. Here again, it’s simply about being mindful of your methods and asking yourself if there is a more eco-friendly way to get the same job done. Maybe you don’t have a large property? It doesn’t matter. You might have an apartment with a small balcony and a few container plants, but you can still create a positive impact. Encourage your neighbors to add a few native container plants to their balconies. Our collective efforts add up. Think outside your own space. Buy from your local farmer who isn’t shipping his or her produce across the country. Support organizations which work on behalf of these ecological principles – like the National Wildlife Federation, Xerces Society or the National Audubon Society to name just a few. I hope you have a favorite organization you do support, and that you share that message with others. In fact, I’d love to hear from you in the Comments section below. What is your favorite ecologically-minded organization? What do you appreciate most about their efforts? The push mowers of today are quiet, effective and – most importantly – don’t emit any air pollution. You’ll also save some money on fuel and filters. Each of us has the ability to be a great role model. 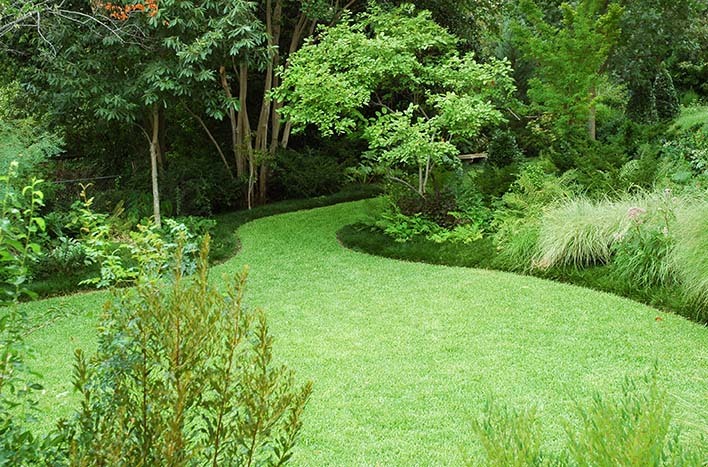 Even if you implement just one of these tenets, you will be lightening your environmental footprint and creating a more eco-friendly landscape. And that, my gardening friends, is what matters most. If you haven’t already listened to this podcast recording, you can scroll to the top of the page and click the Play icon in the green bar under the page title. In the recording, I share another story or two as well as additional examples of how water is displaced from the areas we have traditionally used it.